Gabriele Tarquini (born March 2, 1962) is a racing driver from Italy. He participated in 78 Formula One Grands Prix, debuting on May 3, 1987. He scored 1 championship point, and holds the record for the most failed attempts to pre-qualify, mainly because he was a regular in the pre-qualifying era, usually in cars which were so slow as to struggle to qualify. He made a debut for Osella at the 1987 San Marino Grand Prix. He joined Coloni for 1988 and started 8 of the 16 races, often failing to qualify due to the other slow cars all being exempt from pre-qualifying. His best result was 6th in Mexico. 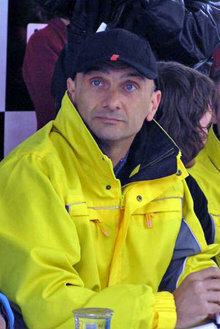 Tarquini signed to drive for the FIRST team, but when their car failed crash tests, he started 1989 without a ride but joined AGS after Philippe Streiff's career-ending testing crash. He came 6th in Mexico and often threatened to score points, running 4th at the Monaco Grand Prix and 6th in the United States. He remained with the team until late 1991, by which time it was totally uncompetitive and on the verge of folding. He moved to Fondmetal, and showed pace for them, scoring a major upset in Belgium by outqualifying Ivan Capelli's Ferrari. This team too soon folded. He was signed up by Tyrrell for the 1995 season and was their test driver. He replaced Ukyo Katayama for the European round as the Japanese driver was injured. But after finishing 14th, Tarquini's Formula One career was over. By this time he had switched to Touring Cars, winning the BTCC title in 1994 in an Alfa Romeo featuring controversial aerodynamic enhancements. He started races in both the British and Italian Touring Car Championship in 1995, and was also in the BTCC for David Richards' Honda team in the late 1990s, taking 4 further victories, as well as racing in Germany's STW Cup and the Belgian Procar series, before switching to the European Touring Car Championship (ETCC) with considerable success, remaining as it became the World Touring Car Championship (WTCC) in 2005. At present he drives a SEAT León in the WTCC.